An ethereal evocation of roses straight from the garden, this romantic flowerpiece illustrates all Stuart Park’s greatest strengths: the botanical accuracy of form and colour, conjured in single masterly brushstrokes; the observation of light diffused through the translucent petals; the sensation of dewy evanescence created by the casual tumble of flowers on a surface that is barely described. 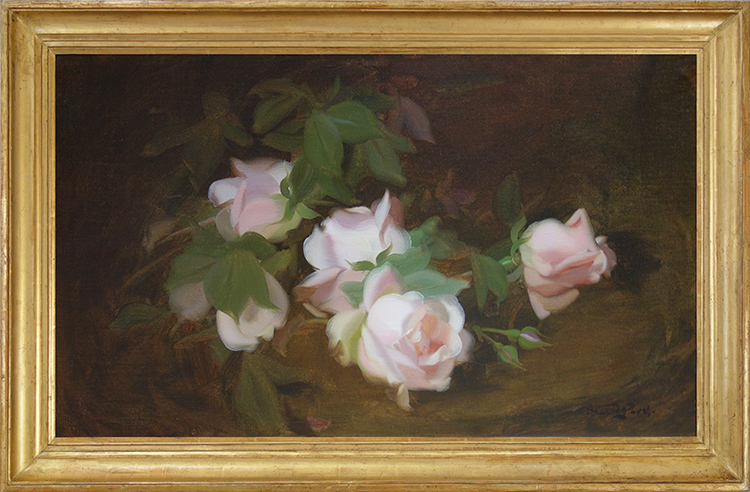 This particular composition has almost the force of a Dutch flowerpiece, a memento mori which uses the subtlety of the roses’ perfection against the earthy ground to conjure their transience. They shine with a ghostly clarity from the shadows where they lie, beautifully and poignantly alive.